Today you may have an exceptionally easy access to your subconscious mind. Pay attention to your dreams. The Full Moon at 11+ degrees of Gemini is a SuperMoon. The Moon is in conjunction with the trans-Neptunian object Altjira. Mercury is the ruler of Gemini, and Mercury is stationary at the Galactic Centre in Sagittarius. The Moon symbolizes our instincts and reactions, and it is a container for our experiences. The Gemini sign is one of the three air signs. Quoting Stephen Arroyo, “The Air realm is the world of archetypal ideas beyond the veil of the physical world; in the air element, the cosmic energy is actualized into specific patterns of thought.” Gemini is the sign of gathering and sharing information. Connections and communicating belong to Gemini. The Roman god Mercury is equivalent to Greek Hermes, the messenger of the gods. Hermes was a god of transitions and boundaries. He was a guide to the underworld. He was able to move freely between the worlds of the mortal and divine. He was the bringer of sleep and the conductor of dreams, and thus we can also consider him as a messenger between the conscious and unconscious parts of the mind. The Full Moon in Gemini is in exact conjunction with 148780 Altjira, a binary trans-Neptunian object discovered in 2001. The secondary was discovered in 2007. It is large compared to the primary and for some reason it has not been named yet. The orbital period is 294 years. 148780 Altjira was named after the sky god of the aboriginal people of Australia. Altjira was the central god of the Dreamtime, a sacred era which existed before the life of the individual began, and continues to exist when the life of the individual ends. In the beginning Altjira created the Earth and gave the humans everything they needed for survival. Then he retired to the sky. The Aboriginals believe that the Dreamtime is a return to the real existence, and that life in this time is a passing phase. They also believe that during sleep a person leaves their body and temporarily enters the Dreamtime. In recent years sleeping disorders have become a growing health problem around the world. Perhaps Altjira’s current journey in the mutable air sign Gemini has something to do with this. Altjira entered Gemini in 2007-2008. The energy in this sign can be nervous and make the planets in the sign more scattered. The ruler of Sagittarius is Jupiter, which magnifies everything it touches. Jupiter at 11+ degrees of Scorpio is forming exact aspects to the luminaries. Neptune rules the oceans, and the ocean is a symbol for unconscious. Dreams belong to Neptune’s dominion. 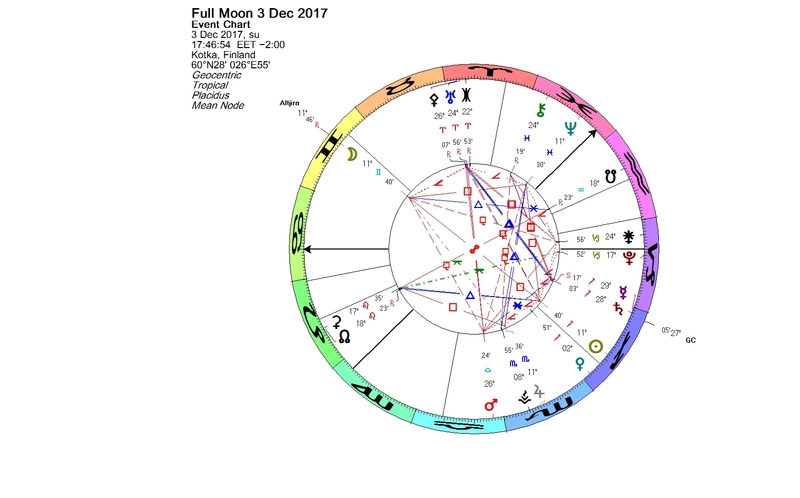 Neptune at 11+ degrees of Pisces squares the Sun and the Moon. A SuperMoon is a term launched by astrologer Richard Nolle. It happens when the Full Moon coincides with the Moon’s closest approach to Earth in its orbit. If you have a clear sky, you can see the Moon shining brighter and larger than usual. This entry was posted on Sunday, December 3rd, 2017 at 10:42 pm	and is filed under Full Moon, Mercury station. You can follow any responses to this entry through the RSS 2.0 feed. You can leave a response, or trackback from your own site.